• Can be completed concurrently with on-mat BJJ training either on non-BJJ days or as 2-a-days, depending upon the athlete’s fitness. • This training plan is one of the 195+ Plans included with an Athlete’s Subscription. Total Body Relative Strength: For the BJJ athlete, a strength advantage is a huge benefit. It won’t make up for a large gap in technique and skill, but it will narrow it. This training plan deploys classic total body barbell exercises with significant level changes, as well as upper body pushing and pulling strength exercises. Loading is heavy, and volume (total reps) is low. The aim is to significantly increase the athlete’s “relative strength” – or strength per bodyweight – not significantly add muscle mass and weight. Grip Strength and Strength Endurance: Studies of BJJ athletes in competition showed a 20% loss of grip strength following a single match. The grip demand is a huge part of the sport, and stronger grip over the duration of a match will enable the athlete to put themselves in better positions for points. You will use your Gi top as a tool for developing grip strength and strength endurance and train your grip 4x/week. Work Capacity based on Level Change: BJJ can transition from standing to the knees to on the ground in a single match or sparring session. The work capacity development in this training focuses on movements which replicate a fast paced match by constantly changing levels at bodyweight or under load. The time duration will vary in length from a full match (5-7 minutes) to repeated short, intense bursts. Chassis Integrity: The chassis strength demand is huge in BJJ, from a variety of positions. You will train mid-section rotation, anti-rotation, and extension movements from the back, standing, and hanging. The goal is to increase your mid-section strength and strength endurance in a functional manner which transfers to the mat. Basic Aerobic Conditioning: BJJ matches are marked by a low to moderate aerobic/cardio efforts broken by intense, high efforts as competitors fight for advantage. This plan deploys long, unloaded, weekend runs at an easy pace to build aerobic base. This plan can be conducted in the same day as BJJ practice, or between practice. Listen your body and if training twice a day is too much, use this plan on days you do not have practice… just follow the session order of the plan. Who is this plan appropriate for? BJJ competitors or recreational practitioners. 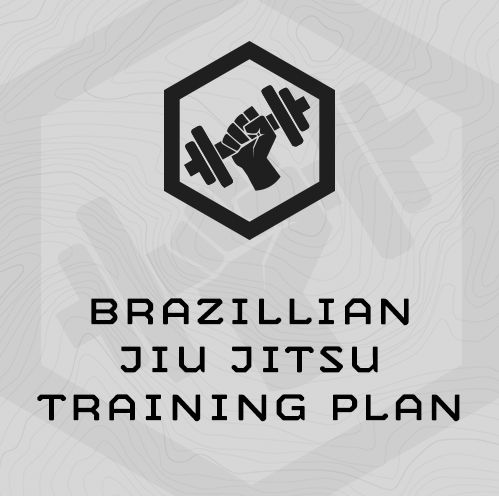 This plan is sport-specifically designed to develop an athlete’s strength and conditioning for the sport of Brazilian Jui Jitsu. How Long should the sessions take? 60 minutes. The Easy Saturday Runs may extend to 90 minutes. What does “1RM” Stand For? 1RM = 1 Repetition Maximum … the most you can lift for 1 rep of that exercise. What does “4/8x” mean? How about “15/25#”? – 15/25# = Women us 15#, Men us 25#. Work briskly and steadily through the circuit, not frantically. Fully-equipped functional fitness gym including racks, barbells, bumper plate, dummbells/kettlebells, sandbags. Your Gi top will be used on M, T, Th, and F.
No Gi top? Use a old towel instead. Can I do this training plan in conjunction with BJJ training? Yes – either alternate training days, or complete 2-a-days – depending upon your fitness level. In general, don’t let the gym-based fitness training in this plan negatively impact the sport-specific technical practice you receive at during BJJ training because of fatigue. What if I miss a training day? Do not skip ahead. Start again where you left off and complete the sessions in order throughout the plan. Example: If your assessment was 1:40, break it down in to seconds. 1:40 = 100 seconds. 100 seconds x .30 = 30 seconds One round will be a 30 second hang from the gi, with a row every 10 seconds. Rest for 45 seconds, and repeat for 5 rounds. Example: You completed 60 total squat thrusts in the Squat Thrust Ladder Assessment. Multiply 60 by 20% (60 x .20 = 12) Conduct 12 squat thrusts every 60 seconds for 8 Rounds. The faster you finish, the more rest you get.